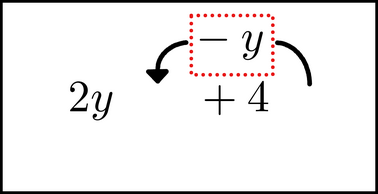 When solving an equation, we often do some operation that involves rearranging the symbols with minor alterations. Symbol motion covers this kind of operation. Other times, we need to replace a few symbols with something else entirely. This happens when we are simplifying or reducing part of the equation. Some simple examples are if we take an expression 4x - x and replace it with 3x, or if we take and simplify it to x. An alteration like this, applied to the image of an expression, is called a morph. A morph is when we take a group of symbols in the image of an equation, and replace it with a smaller or simpler group of symbols that is mathematically equal. The concept is not a big deal; that's exactly what you are doing when you simplify or reduce something, and you do that all the time. So why do we have a whole chapter about it? The difference is that while substitution is a mathematical action, morphing is a visual action. Morphs are often used when doing some kind of substitution, in a broad sense of the word. There are some patterns we can use that make the task easier. This chapter explains them and how to use them. We start with a kind of morph called fusion, and then introduce more general morphs. Something you will do a lot is take a group of terms and reduce it, replacing the original expression with a smaller one. The simplest example of this is basically arithmetic: taking '2x - x' and replacing it with 'x', for example, or replacing ' ' with '3.5'. The act of combining symbols like this is called fusion (or symbol fusion, if you want to be verbose.) A fusion is probably the most common kind of morph you'll use. The name is an analogy to nuclear fusion, which happens when two atoms combine to form a single, different atom. When you visualize the equation, you focus on that part of the image that represents the expression you want to change. You visualize the symbols actually moving together, and shifting form into the reduced expression. This has two fusions, one of which is when the 3x + 2 - 2 is simplified into 3x. The other fusion is a new type, where the x's cancel out in . It may not be obvious that the second one is a fusion. Anytime we take a group of symbols, and replace them with a mathematically equivalent group of fewer symbols, we have fusion. If the expression happens to reduce to zero (when it's being added) or one (when it's being multiplied), so that it would be replaced with nothing, we still call that fusion. This means cancelling out terms in fractions is a kind of fusion. Keep this in mind when you see it later. Imagine the expression collapsing in on itself. Let's note a few things. First, fusion will not do the math for you. You need to be able to calculate that 2y - y = y. What fusion does is help you focus on changing that particular part of the image (and the equation). Second, the details of how this is done are somewhat flexible. You don't necessarily have to visualize the process as shown in these figures. The only requirements are that you (a) start with seeing the expression in it starting form, and (b) end with seeing the expression in its reduced (fused) form. So long as you honor those criteria, you can see them moving together and transforming in any kind of sequence or pattern. It may or may not resemble what is shown in this chapter. Maybe you will see the symbols slurping together and reforming in an animation. Or maybe you will not want to have an animation at all; you will instantly substitute the reduced form, or have it go through one or a few intermediate images. Try a few different methods and decide which works best for you. The next step is to cancel out the x. You can envision this as the part caving in on itself, morphing into nothing. See how the chunk has an irregular shape there. You can do that. As is often the case when you are cancelling a term, it is simple enough that you can just do it mentally without any special technique. Thus, you can simply allow the drop or fade from the image. The two methods shown here are basically ways of doing that same thing. We skipped most of these steps, and when you process it internally, you likely skip them too. Your level of mastery of math is such that, for example, you can go directly from to 3x. You probably did not stop to think of 3x + 0 explicitly. As an analogy, pretend you are crossing a shallow pond, by stepping on a series of stones. Many of the stones are close together, and you can step on each one if you want. If you have long legs and good balance, you can step on every other stone, or even jump across three or eight at a time, and make it safely across. You can stretch and pace yourself. Some days, you will be able to take huge jumps - doing several steps at once, except that it will seem like just one step in your mind. The first time you notice this, congratulate yourself, because that is exactly how a talented mathematician does things. Conversely, if you are tired, you may have trouble taking the kind of jumps you are used to. If that happens, you can just take smaller steps, so to speak. Instead of going from directly to 3, take some or all of the intermediate steps above as you work the equation's image. There is also symbol fission, which is the opposite of symbol fusion. If we replace 2x with 4x - 2x or even 5x - 4x + x, that is fission. You won't split up symbols like this nearly as often, but sometimes doing so is useful, such as when you are factoring polynomials. There is not a way to express square roots using symbol motion, fusion or fission. We need another kind of morph. We are now getting into an area where the technique is less structured than what you've seen so far. The benefit is that such morphs are more flexible, and even somewhat adaptable. Set up the equation so that you can apply the square root to both sides. Add symbols to each side that describe that operation. Simplify each side, one at a time, using all the techniques at your disposal - symbol motion, fusion, or other morphs. Here is an example of how that works. As always, first visualize the equation. Then we do the other side. Instead of a graphical substitution, you can also do an animation. So with the change from to x - 2, you can imagine the part fading out. The animation from to 2 will be more fanciful; most morphs will be like that. Here , a, and b are constants, t is the independent variable, and A = A(t) is the dependent variable. This one is very similar to equations like , which you have probably seen at some point in a textbook (or will see). You want to invert this equation, so that instead of you have . If it was the textbook form, you may actually remember the inverted form, but since it is different you will have to invert it yourself. Let's do that. We start by visualizing the equation, as always. Now we will use the morph. Apply the natural log to each side. Remember what was said in the last section, about crossing the pond using stepping stones? And that with experience, you will be able to take larger and larger 'jumps' in your algebra calculations? This scenario is one place where this can happen. Above, our process changed into , then to a + bt. After you have done this a while, you will go from to a + bt in one step inside your mind. You will chunk the , and morph that chunk directly into a + bt. This kind of progression can apply to all morphs (actually, any mental math you do at all). As you get more experience, you will discover you can do bigger substitutions and changes at once by using bigger or different morphs. Visualize each of the expressions below. In your image, reduce the expression via fusion. Solve each of the following equations mentally. If you need to take a root, or do something else that would lead to multiple solutions, just pick the more positive value at that point. The book Inner Math: How To Do Algebra, Calculus, and more In Your Head, which is a sequel to this one, will show how to do this.